Harukai enters the room as befits someone of Glasstaff's status, mentally preparing to act in character. Then Sildar sees his friend Gundren at the mercy of the dark elf and the huge goblinoid and all Hades breaks loose! Recovering, but not as quickly as usual, Harukai maneuvers to flank the bugbear with Sildar. Smiling at Jackson's protective stance over Gundren, Harukai focuses on the bugbear in front of him. Flashing the glowing Moonsword in a weaving pattern, Harukai snaps the glass staff at the creature, following up with two quick kicks at its knees, trying to cripple his enemy. 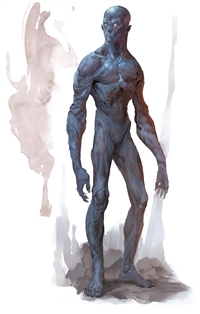 OK, so following Jackson's healing and aid spells, the drow rushes Sildar and attacks using both its unarmed fists/forearms to make a slamming attack. OOC: So, Nilparin is next, then the 'friendly' wolf, then top of the round? The wolf 'Snarl', looks confused at the sudden aura that has come over him. He understands from his training that he should attack the incoming enemies, but something in his mind is telling him they are friendly. He stops watches the scene before him, unsure what to do. He takes the dodge action. Top of the round and Sildar reaches out and grabs the drow that attacked him, casting shocking grasp. And as he is reaching for the drow's arm, it side steps and he cannot make contact, his electrical energy fizzling at his fingertips. Grol will attack Harukai with his morningstar, who damaged him last. Harukai tries to dodge the morning star swung by the brute, but it just clips him in the side, ablating the magical protection Jackson bestowed and bringing up a lumpy welt on his ribcage. OOC: We waiting for Nil from last round? OOC: Yes I saw Nil's post about taking his 5 HP and then got mixed up on him not going yet. His turn will take place before Sildar and Grol's. Still staggering from the heavy blow from the Bugbear, Harukai maintains flanking position and flings the glowing Moonsword high into the air. As the brute looks up at the spinning light, Harukai summons the last vestiges of his Ki and grabs his staff with two hands, thrusting it right at the solar plexus of the creature, then following up with two forearm slams directly to its throat. Jackson will turn back to make sure Gundren is doing okay, dropping his shield in front of the dwarf. "Take up my shield, just in case." Then Jackson will clutch Talon with both hands and attack the drow. OOC: on whom are we waiting? Nil strikes out with his dual blades, with his first swing missing but his follow up connecting. Sildar and Grol move as above. Two of Harukai's flurry of blows misses, but one connects with Grol. Jackson also misses with one attack and one connects. The drow, being struck by two strikes, has a strange change come over his face momentarily but goes away quickly. He again attacks Jackson with a forearm slam. It is Nil's turn again. Nil swings with his two swords, slicing across the torso of the drow. Suddenly, as the influx of pain causes it to lose concentration, the drow suddenly transforms into its true form, a doppelganger! Snarl the wolf continues to be confused by the turn of events, deep down he feels he should attack those who are attacking his master, but he also has a strong feeling that they do not wish to harm him. He takes the dodge action. Sildar, determined to take down King Grol, draws his long sword and swings with two hands at Grol. Grol side steps Sildar's blade and swings back with his morning star. Sildar takes another great slam from the morning star, but shrugs it off and readies himself for another attack at Grol. Jackson is a bit taken aback due to the drow's sudden change into a doppelgänger, but he remains focused on the task at hand and lays into it with Talon. "Nicely struck, Brother Greystone!" Harukai calls out as Jackson lays into the strange form the drow has transformed into. OOC: Drow/Doppleganger turn is next if it is still up. I will go ahead and post Harukai's turn since he is right afterwards. Concerned about the heavy blows Sildar has been suffering, Harukai calls out, trying to focus the brute's attention on himself, "This can't be the real goblin king--he hits like a sickly kitten!"